Joseph and Sarah were married on 10 January 1809 at Fressingfield after banns had been called on 18 December 1808, 1 and 8 January 1809. Unusually for that period, both Joseph and Sarah were able to write and each signed the parish register on their wedding day. The two witness to the marriage, Thos Davy and Lucy Aldrich, also both signed the register. We do not as yet know what relationship the two witness were to the bride and groom. According to the parish register entry for their wedding, Sarah came from Fressingfield whereas Joseph came from what appeared to be 'Tlradbrook'. This is likely to be Stradbroke, a village three miles south west of Fressingfield. 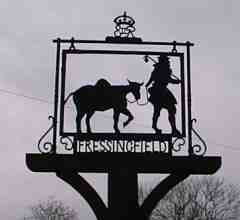 Althought they were married in Fressingham, Joseph and Sarah spent most of their married live in the next village, Wingfield. Sarah was born in Fressingham and baptised in the parish church on 6 May 1787. On 16 April the previous year, her parents had christened another daughter Sarah but she died in infancy. 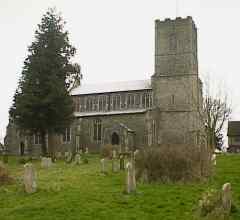 Sarah's parents, William Davy and Mary Aldous were married in Fressingfield parish church on 12 October 1780. Both William and Mary signed the register with a 'X'. Joseph Pulham was a farmer according to the Wingfield parish register of the baptisms of twelve of his thirteen children. The entry against his last son's baptism gave his occupation as 'husband man'. Although infant mortality was high at this time, most of Joseph and Sarah's offspring survived childhood. It is interesting to see that after the death of each of their two sons, the next child born was given the same name. It is interesting to note that the surname 'Wingfield' was found within the Wingfield parish registers. It therefore seems likely that the name 'Pulham' may well appear in the registers for the Pulham parishes just a few miles north of Wingfield. In the 1881 census, Charles Pulham was living with his wife Mary in Wootten Green, Stradbroke. Living with them was their married daughter Sarah A. Smith and their grand daughter Maude M.P. Smith. Charles' younger brother Joseph was living in Ipswich St Margaret with his deaf wife Henrietta. Another brother, Sidney, was also living in Ipswich St Margaret with his wife Harriet.